During the long years of struggle Eritrea was blessed with internationalist support, political parties, film makers, researchers, academicians, trade and student unions, anti-colonial and human rights activists etc. 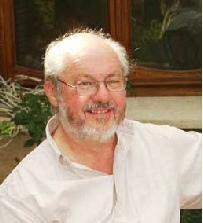 One of the many supporters was Professor Lionel Cliffe. We are protesting a fundraising party inside Park Plaza hotel organized by the Eritrean government. 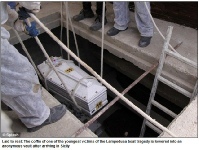 On October 3, 2013, a boat carrying over 500 Eritrean migrants (who were fleeing the totalitarian regime in Eritrea) capsized off the cost of Lampedusa, Italy. Over 350 Eritrean including women and children died. While Pope Francis from the Vatican visited the site and the remaining survivors, the Italian Prime minister promised a state funeral. 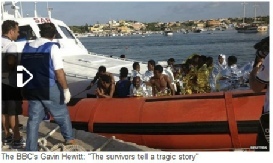 In the mean time, the Eritrean government said little to nothing and ignored this horrific tragedy hoping for the story to go away. Tonight (Oct 19,2013), while many of us are still mourning, the Eritrean government had organized a fundraising party inside Park Plaza hotel to support its military. The money raised in this event will directly be sent to Eritrea using illegal means to bank roll the government and further detain and torture our brothers and sisters who are less fortunate than us, who are still back home. Fundraising for this regime is not only unethical but it is also illegal because the UN Security Council has imposed sanctions on the government of Eritrea over its support of terrorist groups such as Al-Qaeda and Al-Shabab of Somalia. Over the years, Eritreans have been fleeing their country in their thousands with the solitary aim of staying alive top of their agenda. The brutality of the regime in Eritrea has seen the youth withering away within the confines of an indefinite national service while an estimated 10,000 people are thought to be held incommunicado as political prisoners. In the wake of the latest Lampedusa disaster which has claimed the lives of at least 367 people, mostly from Eritrea, we call on Eritreans and peace-loving citizens of the world to unite against injustice. When will the ordeals of Eritrean youth end? እዚ ስቅያት መንእሰያት ኤርትራውያን’ሲ መዓስ’ ኮን የብቅዕ ይኸውን? እዚ ስቅያት መንእሰያት ኤርትራውያን’ሲ መዓስ’ ኮን የብቅዕ ይኸውን? 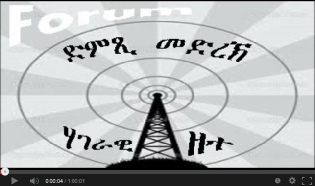 New Radio broadcast ‘Dimsti Medrek’ is due to start it’s four-day short-wave broadcast in Eritrea. At least 27 people died when a boat carrying more than 200 migrants capsized in the Mediterranean, Malta's prime minister has confirmed. 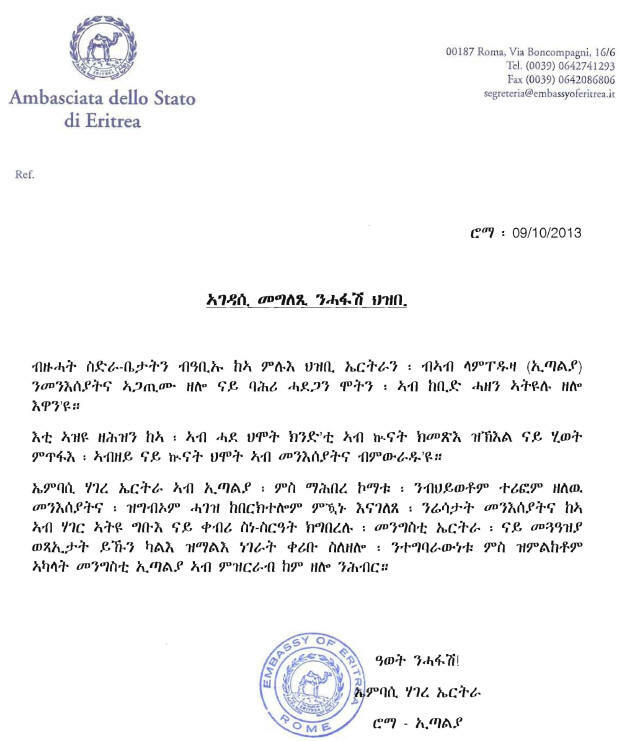 The Government of Eritrea issues a Press Statement, on the Eritrean lives perished in Lampedusa, Italy, on the 3rd of October 2013. 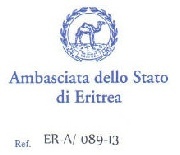 The statement was issued to-day, 09 October 2013.The Eritrean Government and its only state-owned media have, until to-day said few words about the Lampedusa victims, as the whole world voiced their plight, and Eritreans world-wide mourned on the incident. The Eritrean state-media portrayed the victims were from East-African countries, despite the fact almost all of the 500 victims were Eritrean citizens. 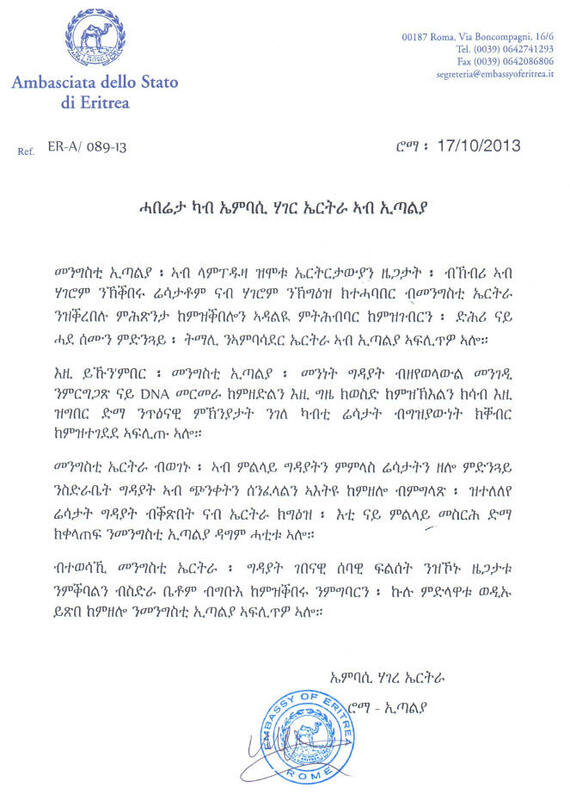 Eritreans worldwide are expressing their call for a proper burial ceremony of the victims, in their homeland. The government press statement, therefore is coming after such demanding issues and the case has already raised serious concerns among UN and international bodies. The statement read on State-TV (ERI-TV), on its Tigrigna Broadcast, today, the 9th October 2013; the statement, among other things, accused “perpetrators and human-traffickers” and largely blamed the US Administration as the main cause of the problem. ካብታ ኣብ ማያት ኢጣልያ (ላምፐዱሳ) ዝጠሓለት ጃልባ ውጻእ-መዓት ዝኾኑ ኤርትራውያን ዜጋታት ዝተገብረ ቃለ-መጠይቕ፡ ኣዝዩ ዘሰቅቕ ዛንታ። Intervew with rescued Eritreans from the sank boat at Lampedusa, Italy; a very disturbing account. Asmara, 6th September 2013, Festival of Eritreans in Riyadh and its environs, Saudi Arabia, which was opened by Ms. Askalu Menkerios, the Minister of Tourism, was conducted with patriotic zeal under the theme "ERITREA - Shield of Resilience and Nobility of Work" from the 3rd to the 5th of October. ንሕና ኤርትራውያን፡ ንኤርትራዊ መንእሰይ ካብ ሃገሩ ዘንፍጽ ጠንቂ ከምዘሎ ክንኣምን ኣሎና። ነቲ ጠንቂ ንምእላይ ምድጋፍ ሓደ መንገዲ ኢዩ፡ ካብኡ ዝተረፈ ድማ፡ ንመንእሰይ ኤርትራዊ፡ ኣብ ሓደጋታት ከይወድቕን ክጽመም ከምዘለዎን ክንምዕድን ኣገዳሲ ኢዩ። እዞም ግዳያት፡ ኣካል ናይቲ ልዕሊ-ዝግባእ ሃገራዊ እጃሞም ዘበርከቱ ኤርትራዊ ቤተሰብ ኢዮም፡ ገለ’ውን ደቂ-ስዉኣት ኢዮም። ስለዚ ኩልና ኣዚና ክንጉህየሎምን ክንሓዝነሎምን ይግባኣና ኢዩ። ስለምንታይ መንግስቲ ኤርትራ፡ ወይ ውን ጋዜጣታት ወይ ተለቪጅን ኤርትራ፡ ነዚ ብዝግባእ ዘየቃልሕኦ ኢልና ክንደናገር ኣይግባእን። ነብስናን ነብሲ-ማትናን ነስተብህልን ንሕተትን’ሞ፡ እዞም ግዳያት መን ምዃኖም ዘማትእ ኣይኮነን!